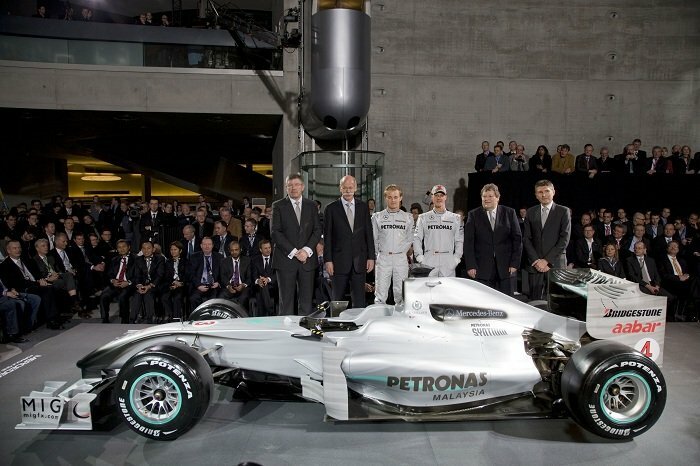 Over 600 guests, including 200 media representatives and 200 Mercedes-Benz employees, visited the Mercedes-Benz Museum, one of the biggest and most famous car museums in the world, to see the launch of the team and the unveiling of the new Silver Arrows livery. 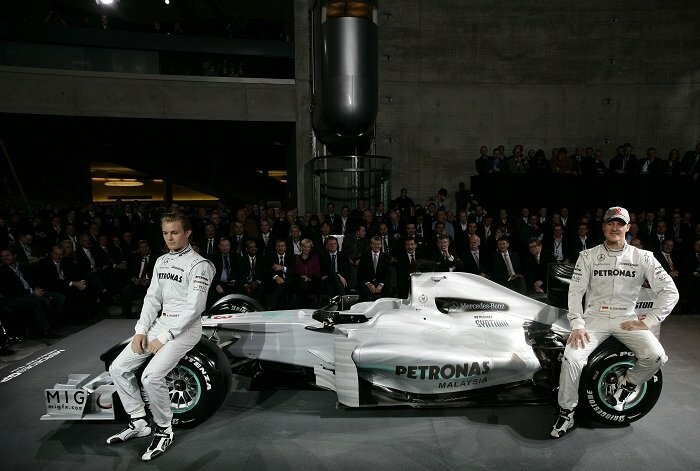 Mercedes-Benz employees from the company’s manufacturing plants in Untertürkheim and Sindelfingen, 100 of whom were invited for their outstanding performances and 100 selected through a popular internal draw, also had the opportunity to take their first look at the new MERCEDES GP PETRONAS team. 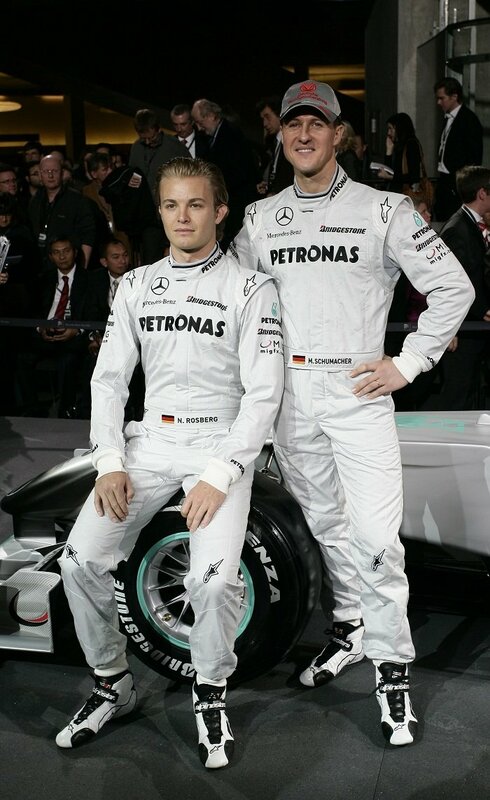 The event opened with a welcome speech by Dr. Dieter Zetsche, CEO of Daimler AG and Head of Mercedes-Benz Cars before Michael Schumacher and Nico Rosberg presented the new Silver Arrows livery for the 2010 season on last year’s car. The team’s 2010 car, the MGP W01, will make its track debut at the first Formula One test in Valencia on Monday 1 February, with the 2010 Formula One season starting in Bahrain on 14 March. 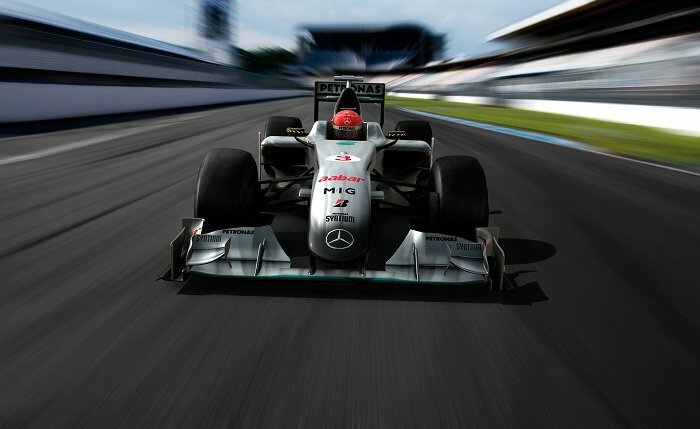 The new silver and green livery creates a true marriage between the heritage of the Silver Arrows and the team’s title partner PETRONAS. The legacy of the Silver Arrows goes back to the 1934 Eifel Race when, on the evening before the event, the white paint was sanded off the Mercedes W25 race car to fulfil weight regulations (750kg formula) and the silver colour of the aluminium surface of the car appeared. This season, with the return of the Silver Arrows, the MGP W01 will shine in silver combined with a flow of iridescent silver shading. On the nose and on other parts of the car traces of black carbon fibre visible are visible – a reminder of the first Silver Arrow of 1934.